A recall has been issued for store-brand infants’ ibuprofen sold at Walmart, CVS and Family Dollar locations nationwide. 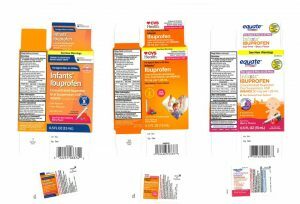 Walmart: Equate: Infants’ Ibuprofen Concentrated Oral Suspension with lot numbers 00717009A, 00717015A, 00717024A with expiration dates of 2/19 and 4/19. NJ.com reports New Jersey-based pharmaceutical company Tris Pharma announced Wednesday that three lots of its “Infants’ Ibuprofen Concentrated Oral Suspension, USP (NSAID)” have been found to possibly contain higher amounts of ibuprofen than shown on the label. Half-ounce bottles of the liquid ibuprofen are supposed to contain 50 mg per 1.25 mL of the pain-reliever/fever-reducer medication. According to ABC, no illnesses or “adverse events” have been reported, but the company issued a voluntary recall out of an abundance of caution.